The hardline Islamists who seized control of Timbuktu along with the rest of northern Mali three months ago, consider the shrines to be idolatrous and have wrecked seven tombs in two days. Mali's government and the international community have expressed horror and outrage at the destruction of cultural treasures in the fabled city, an ancient desert crossroads and centre of learning known as the "City of 333 Saints". "My message to those involved in these criminal acts is clear: stop the destruction of the religious buildings now," ICC Chief Prosecutor Fatou Bensouda told AFP in an interview in Dakar. "This is a war crime which my office has authority to fully investigate." She said that Mali was signatory to the Rome Statute which established the ICC, which states in Article 8 that deliberate attacks against undefended civilian buildings which are not military objectives are a war crime. File photo of an Islamic center and a mosque in Timbuktu. Al-Qaeda linked Islamists in northern Mali went on the rampage in Timbuktu Saturday, destroying ancient tombs of Muslim saints just after UNESCO listed the fabled city as an endangered world heritage site. "This includes attacks against historical monuments as well as destruction of buildings dedicated to religion," said Bensouda. On Saturday the Islamists destroyed the tombs of Sidi Mahmoud, Sidi Moctar and Alpha Moya, and on Sunday attacked four more including Cheikh el-Kebir's mausoleum as residents stood by helplessly. Crying "Allahu Akbar" (God is Greatest), the men carrying chisels and hoes smashed the tombs. "There are many of us watching them destroy the mausoleum. It hurts but we can't do anything. These madmen are armed, we can't do anything but they will be cursed that is for sure," a journalist said on condition of anonymity. He said the destruction at the Djingareyber cemetery ended in the late afternoon, with four tombs in total destroyed. The Islamists also destroyed earthenware jars and other artifacts around the tombs. The cemetery is situated in the south of Timbuktu in the suburb of the eponymous Djingareyber mosque built from mud in 1327. Another resident of Timbuktu, a former tour operator, said the Islamists had also threatened to destroy the ancient mosques. "This morning (Sunday) the Islamists told us that if there are saints inside the mosques, they will also destroy these mosques." Several saints are buried inside the city's three historic mosques. Timbuktu is also home to 16 cemeteries and mausoleums, according to the UNESCO website. The Islamist fighters from Ansar Dine (Defenders of Faith) are among the Al-Qaeda-linked armed groups which occupied the north of Mali in the chaos that emerged after a March coup in Bamako. Their presence in Timbuktu and continued violence in the region prompted UNESCO on Thursday to list the city as an endangered site. "It is Islam which is good," Ansar Dine spokesman Sanda Ould Boumama said when asked about the outpouring of anger and emotion over the destruction of the mausolea. "God is unique. All of this is haram (forbidden in Islam). We are all Muslims. UNESCO is what?" Boumama said on Saturday. He said the group was acting in the name of God and would "destroy every mausoleum in the city. All of them, without exception". Mali's Culture and Tourism Minister Fadima Diallo on Sunday urged the United Nations to take action to preserve her country's heritage. "Mali exhorts the UN to take concrete steps to stop these crimes against the cultural heritage of my people," she told UNESCO's annual meeting in the Russian city of Saint Petersburg. "I am pleading for the international community's solidarity," she said, ending her emotional address by saying: "God help Mali". United Nations chief Ban Ki-moon deplored the destruction of tombs, with his spokesman Martin Nesirky quoting him as saying: "Such attacks against cultural heritage sites are totally unjustified." An Islamist rebel of Ansar Dine makes a victory sign near Timbuktu, rebel-held northern Mali. The hardline Islamists who seized control of Timbuktu along with the rest of northern Mali three months ago, consider the shrines to be idolatrous and have wrecked seven tombs of Muslim saints in two days. Nesirky added: "The secretary-general calls on all parties to exercise their responsibility to preserve the cultural heritage of Mali." Ban also reiterated his support for ongoing efforts of the Economic Community of West African States (ECOWAS), the African Union and countries in the region to "help the government and people of Mali resolve the current crisis through dialogue." 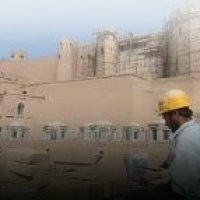 The attacks were reminiscent of the Taliban blowing up the giant Buddhas of the Bamiyan valley in Afghanistan -- an ancient Buddhist shrine on the Silk Road and a world heritage site -- in 2001 after branding them un-Islamic. UNESCO session chairwoman Yeleonor Mitrofanova told a meeting in Saint Petersburg that the destruction was tragic news. "I appeal to all those engaged in the conflict in Timbuktu to exercise their responsibility -- for the sake of future generations, spare the legacy of their past," she said. In a matter of months Mali has gone from one of west Africa's stable democracies to a nation gripped by deadly chaos. The March 22 coup eased the way for Tuareg separatist rebels -- descendants of those who founded Timbuktu in the fifth century -- to carry out the armed takeover of an area larger than France they consider their homeland. However the previously unknown Ansar Dine group fighting on their flanks seized the upper hand, openly allied with Al-Qaeda in the Islamic Maghreb, and have since pushed the Tuareg from all positions of power. The international community fears the vast desert area will become a new haven for terrorist activity and the Islamists have threatened any country that joins a possible military intervention force in Mali.